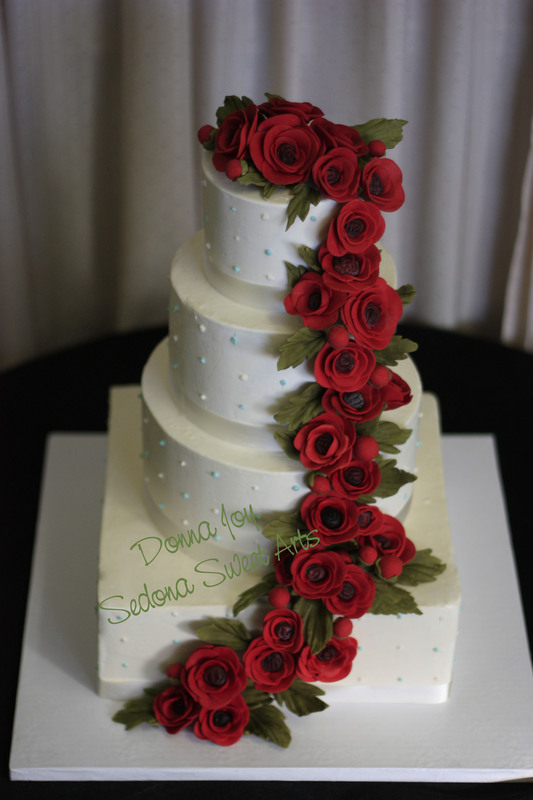 Here is a cake we just loved, dark red Sugar ranunculus created custom for a bride who wedding was all red flowers. We changed it up to match the florist the week before! Donna Joy had to pull a few all nighters to get these sugar flowers sculpted in time. We can’t wait to see the photos of the reception as all the flowers are suppose to be red red red. In all shades, no other colors according to the Bride. Peonies, ranunculus, and orchids were to be the only flowers used. Donna Joy did it again making these stunning fun flowers from sugar. A buttercream canvas with accent dots in 2 colors. Created for a wedding at Sedona Rouge Hotel & Spa we love our Brides and wedding venues. To see more of Donna Joy work check out our web site Sedona Wedding Cakes, or facebook. Wow! beautiful wedding cake. I love it! The floral designs are really awesome. Thumbs up for this. These wedding cakes are awesome! Well I guess not all of them are wedding cakes, but this blog is so fun! I am amazed at your talent.